Costa is a mass market cruise line. They are, however, creating a new type of cruising for themselves that was once the province of premium and luxury lines. One set of remains found aboard Costa Concordia after it was righted has been identified. Meyer Werft said today that Norwegian Getaway would be floated out of their covered building dock in Papenburg (Germany) on Saturday, November 2 at approximately 10:30am (local time). When last seen, the aging polar cruise ship Lyubov Orlova was floating in the North Atlantic. The ship broke free of its tow line as it was being towed from Canada to the Dominican Republic for scrapping last January. Now the Irish Coast Guard believes it's threatening Ireland because of an unusual biohazzard. When MSC Cruises sends MSC Divina to Miami next month, they won’t be sending it empty. It will be loaded with wonderful things Italian from all the companies MSC has partnered with to have their products served aboard MSC Divina, so it will be like a little bit of Italy in the Caribbean. CND subscribers also read about an Escape to Bermuda ... and a lawsuit that will have Carnival lawyers scratching their heads. Costa Cruises is investing another $18 million to help keep the brand in a leadership position in the Asia market. They are doing so with a three-week drydock of Costa Victoria that will again upgrade the ship specifically for Asian tastes. Costa Victoria sails in Asia year round with most of the time is spent in China. Set the DVR! Popular Food Network Chef (and restauranteur) Guy Fieri is taking his family on a cruise aboard Carnival Breeze, and he took a Food Network camera crew along. You’ll be able to watch the family vacation on the Food Network Monday evening (October 28) at 9pm ET/PT (8pm Central), and they’ll do things every family does on their Carnival cruise, as well as some things only the Fieri family would do. Next May, Windstar will acquire Seabourn Pride, and it will become Star Pride. It will open a new world to Windstar since it is quite different from the rest of their fleet of sail-powered vessels with quite different capabilities. Part of that will be expanding into new regions, and Star Pride will take them to one beginning next October when it leaves the Mediterranean and heads to Southeast Asia via the eastern hemisphere. CND subscribers also read about Norwegian starting to hire in Belize ... how it's starting to look like a ship (more) ... looking back with Captain Stubing ... and the gift that won't be regifted. 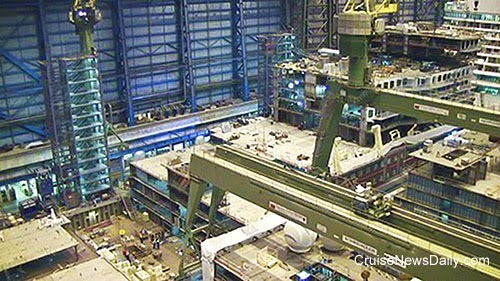 Actual construction of Royal Caribbean's Quantum of the Seas has been underway for about five months at Meyer Werft in Germany, and if you look closely, it's beginning to look like a ship as you can see in the photo below taken yesterday. In the video below, some of Royal Caribbean executives from the shipbuilding department give us an update on the construction. Delivery of the 158,000-ton vessel is set for the fall of 2014, a little less than a year away. Crystal Cruises is facing a problem, and it’s one of those where no solution is going to make everyone happy. They’ve had to choose the one that’s going to make the fewest number of people unhappy. Beginning in January, Crystal will limit passengers to one free trip to each specialty restaurant per voyage. Passengers may opt to dine in the specialty restaurants more than once, but those additional times will be on a space available basis at a charge of $30 per person. A crew member from Carnival Conquest died in an unusual accident on the outside of the ship during its turnaround in New Orleans on Sunday.